Attached photo shows the four young D&G farmers flying a Scottish flag at the Denver Cattle Show. 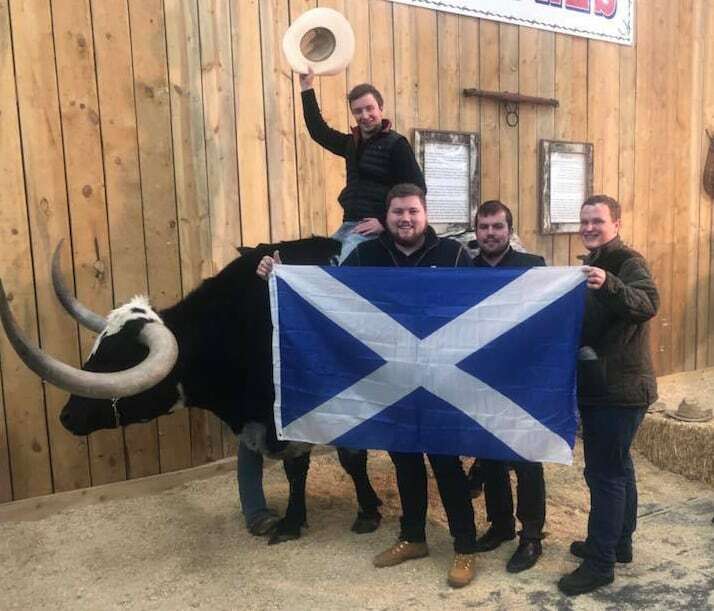 Four young farmers from Dumfries and Galloway have flown out to Denver in the United States to visit the Denver Cattle Show on a learning journey organised by the Galloway Cattle Society. The trip is the first in a series of three international learning journeys designed to inspire and upskill farmers’ under 30 who have an interest in the Galloway breed. The project is part of the Galloway Cattle Society’s Defining Galloway Beef project, which is part funded by Dumfries and Galloway’s LEADER programme. The four farmers, Andrew Hunter Blair from Dalry, Alexander Davidson from Thornhill, Callum Park from Sanquhar and Jim White from Dalry, are being shown around by Montana based Galloway cattle farmer Harley Blegen, who is exhibiting at the Show – which is one of the biggest in the world with more than half a million people visiting over the 16 day event. “Inspiring the next generation of Galloway farmers is absolutely essential to secure the long term future of our native cattle breed, and it’s particularly nice to be launching this new initiative for the Society right at the start of Scotland’s Year of Young People.